Trikes are just plain fun! Flying an Ultralight trike in either configuration: Paraglider or Hang Glider style, are the most enjoyable way to enjoy the friendly skies! 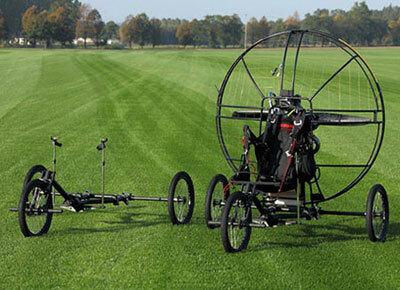 Paramotoring Trikes simply roll into flight, allowing a pilot to launch easily with their paraglider when there is no wind - the most challenging PPG launch condition. No carrying the heavy motor unit on your back! No more running forward launches! Landing in no-wind conditions with no running! Save your knees, legs and ankles and say goodbye to broken props and cages. 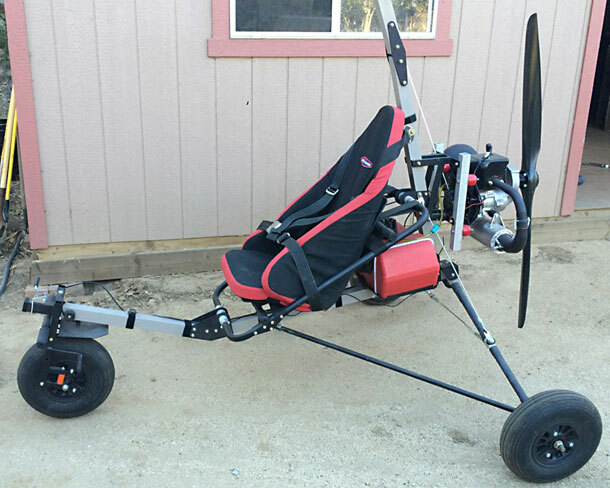 With proper training, this new buggy will make those calm condition flights not just possible, but fun and easy! You'll actually smile when the other pilots worry about whether they can pull off a no-wind launch when the air is smooth and sweet, knowing that you can taxy along after inflation and roll right into a controlled launch. Come into your landing at full speed, with just a nice flare to round out the approach, and roll into a superb touch-down! Some pilots simply do not have the physical strength or stamina to manage foot launch technique especially in light or no wind with a powerful, heavy machine on their back. Now those with bad knees, back, or certain other physical challenges have an option to fly. Trikes are also ideal for women. PPG requires more strength than free flight paragliding, and now the trike offers your wife or girlfriend the opportunity to join you in the sky without having to become a female bodybuilder! 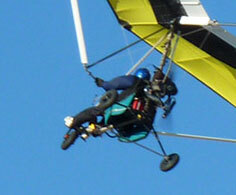 People sometimes see powered paragliding as either foot launching or using wheels. The fact is that you don't have to limit yourself to one. Both have significant advantages. 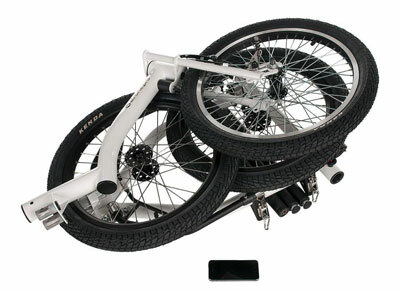 Weight Shift Control (HG) Trike! Our Soaring Trike consists of the North Wing ATF Singe-Place Soaring Trike and the reliable Top 80 engine (or powerful Minari 180cc). The ATF is a nanotrike intended for use as a motorglider, taking off under power and then shutting down the engine for soaring flight. The aircraft was designed to comply with US FAR 103 Ultralight Vehicles rules, including the category's maximum empty weight of 254 lb (115 kg). The aircraft has a standard empty weight of approx 186 lb (84 kg). 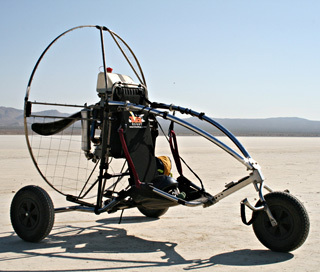 It features a minimalist design, cable-braced hang glider-style high-wing, weight-shift controls, a single-seat, open cockpit, tricycle landing gear and a single engine in pusher configuration. 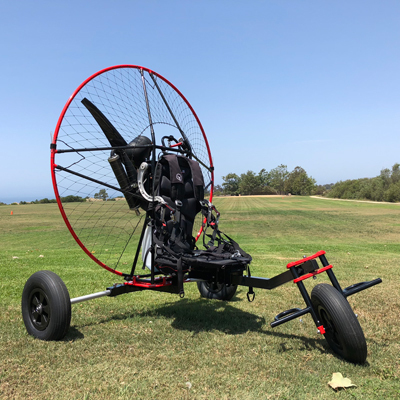 The ATF Soaring Trike (ATF = Air Time Fix) adds power to your hang glider so you can climb to the thermals and power-off for lightweight trike soaring! You can use your hang glider with the ATF Trike. Some pilots may want to use the specially-designed Solairus wing which has been built specifically for lightweight trikes, with a state-of-the-art airfoil design. The new strutted, double surface Solairus wing provides best performance for cross-country, has a great sink rate and slow-speed handling, and is great for short-field take-offs. No mountain, no problem! Couple this super leightweight trike with the reliable Top 80 engine, and you have a very nice soaring trike! Another great wing that works well with this combination is the Wills Wing Falcon Tandem Hang Glider. This glider is very stable, predictable and responsive and just feels comfortable in just about every soaring situation. 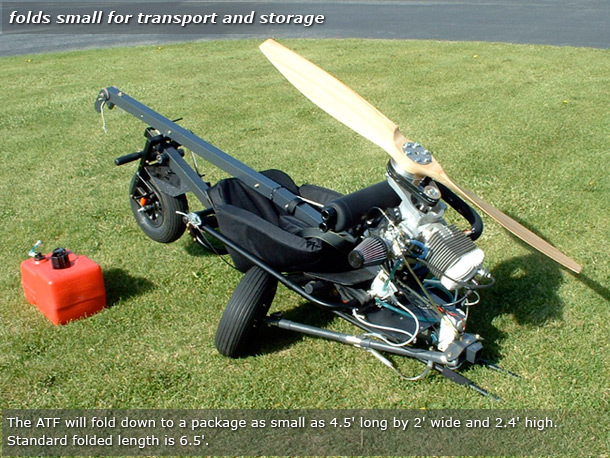 The ATF Soaring Trike is available with either the Top 80 or Minari 180cc engine, and either with or without a Solairus or Falcon Tandem wing. More information about the Top 80 and Minari Engines can be found HERE. ATF from Chad Bastian on Vimeo.